SB just past NY 134. SB through the NY 9A/100 duplex; group photos 1-2 and 3-5 at the same interchanges. Everything is old, including button copy in the first photo. 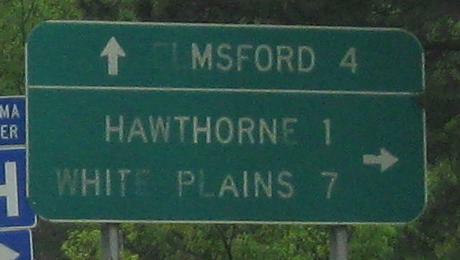 The left exit is part of an inside diamond necessitated by the southbound Taconic State Parkway being immediately adjacent to NY 9A/100 NB, such that underneath NY 117 appears to be a single reversed-direction highway. 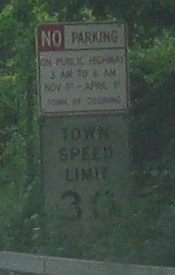 This part is known as Briarcliff-Peekskill Parkway but is only signed as NY 9A and 100. 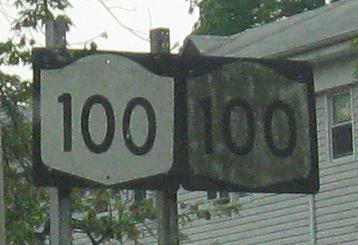 The last photo is the ramp from NY 9A that carries mainline NY 100 SB. 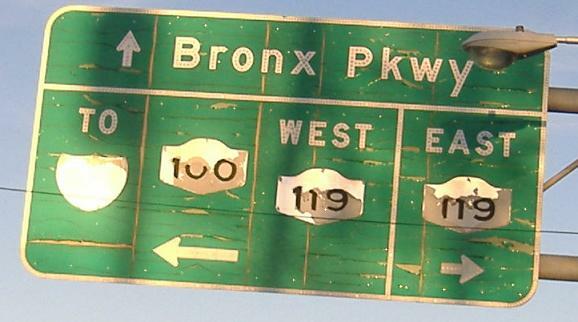 Bronx River Parkway has the right arrow, except New York doesn't use that color scheme. 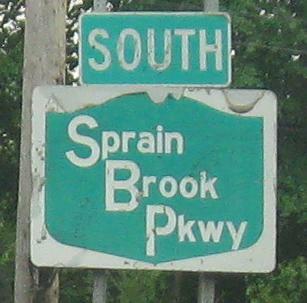 So it should really match the Sprain Brook Parkway shield in both width and arrow style. 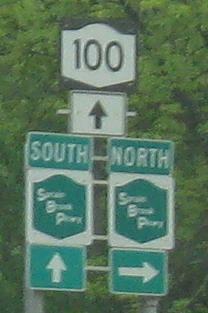 SB up to NY 100A/100C (C to the right, A straight, and 100 turns left). 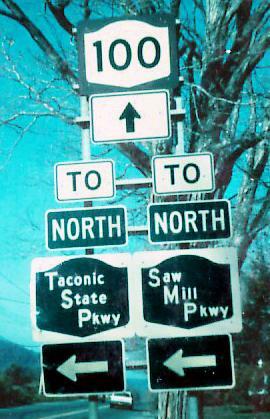 Second photo is Taconic to Saw Mill. 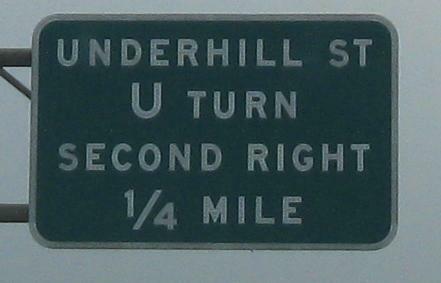 I have this written as SB at Sprain Brook Parkway, taken by Michael Summa in 1976, but it can't be - there's no SB left turn that would lead to the NB Sprain. So it must be NB. Undoubtedly, the old signs look better than the new. 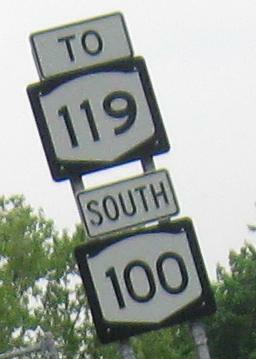 Continuing SB/EB on NY 100/NY 119 approaching the multiplex breakup. 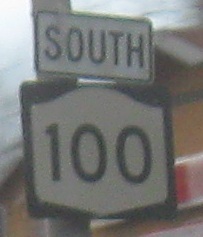 NY 100 NB at the same intersection. From this direction you can clearly see which routes are on which legs (Bronx Parkway, aka Bronx River Parkway - big difference - is half a block east of NY 119 here in White Plains). 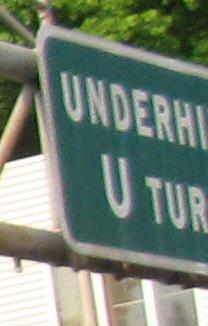 By the way, to the left is I-287, which you'd know if you saw the sign 20 years ago or something. SB. 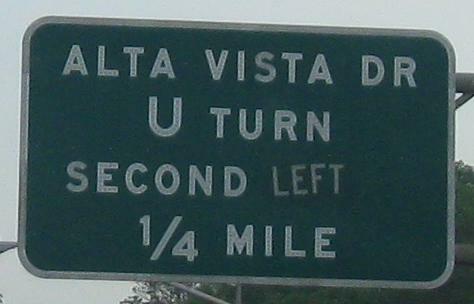 I guess Alta Vista Dr. isn't to the right after all. In the last two photos, a NB U-turn puts a reassurance shield in a very strange location, perfectly visible by SB traffic. 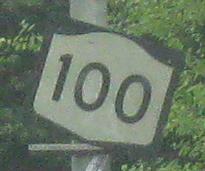 I have to turn onto that thing to stay on 100? An arrow would be appropriate. Half a sign is better than none, especially since I took all of these NB signs over my shoulder as I headed SB. 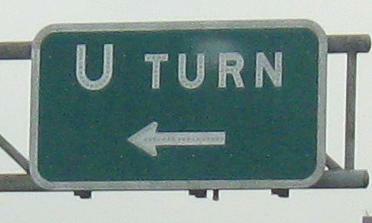 This used to be an even split of 2 lanes and 2 lanes, but now the Tuckahoe Rd. 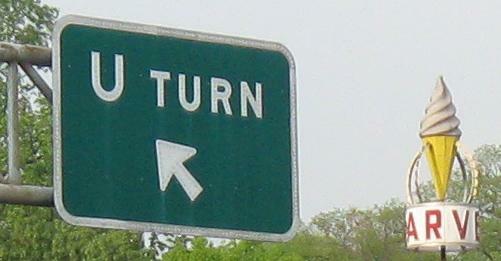 exit allows parking in the right lane. 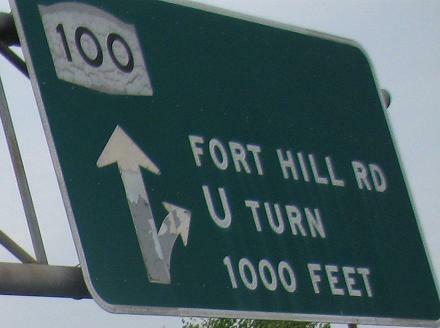 NYSDOT should have removed the corresponding arrow; at night, drivers unfamiliar with the area may try to follow it with disastrous results. By far my best photo of the NB side, these are the left and right sides of the same gantry. 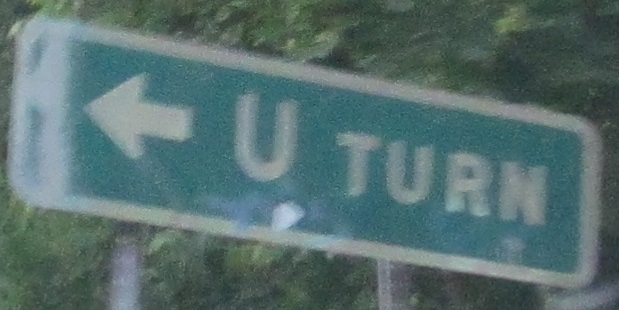 I cropped these out of the same photo as separate signs because they came out that well, and I'd hate to diminish the quality of these fine old specimens. Why replace the old shield when you can stick it on the side uselessly? 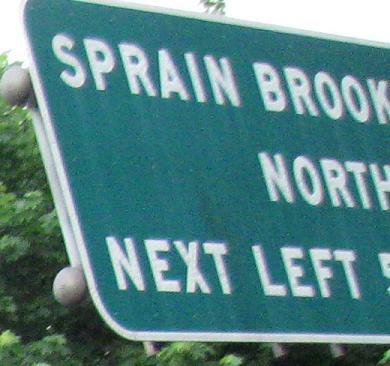 All again SB, and we visit Sprain Brook Pkwy. for the last time at a whole mess of wrong shields. In the third photo, the parkway shields are ugly and the writing is too small, but at least the correct concept is used (first letters bigger, other letters lower-case). 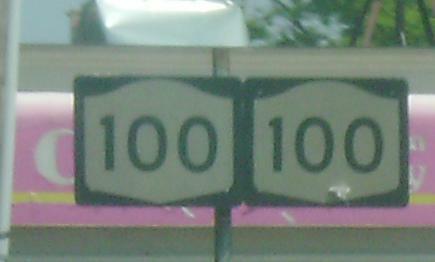 In the last photo, the shields are completely wrong (matching the ugly and incorrect 100's), and the lettering uses the wrong concept. 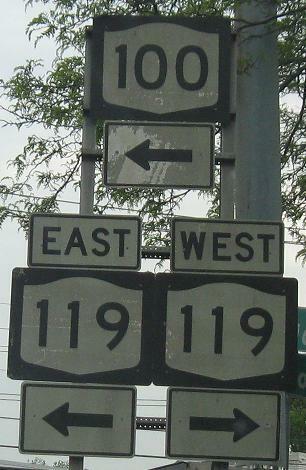 Just because you repeat it, NYSDOT, doesn't make it right. Here's a northbound double-shield by Verona Ave., courtesy Adam Moss. 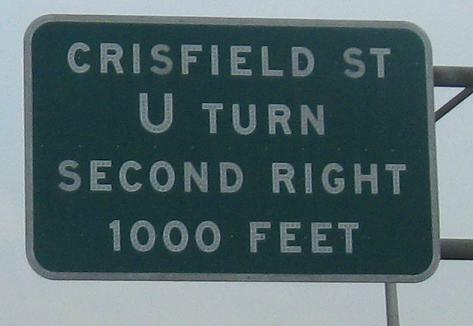 Both his and mine are at left turns that go into U-turn ramps (the opposite of a jughandle), so perhaps they one time were an actual assembly (i.e. 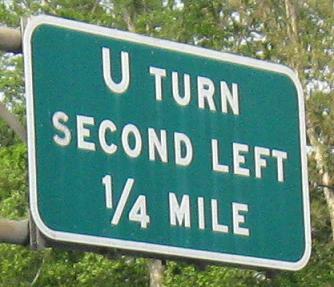 in this case SOUTH left and NORTH straight). NB gets a much better sign. I only got half. 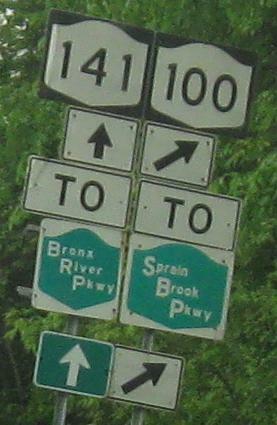 A show of Central Park Ave's quasi-parkway nature and more unique U-turn signage approaching the end of NY 100 SB. 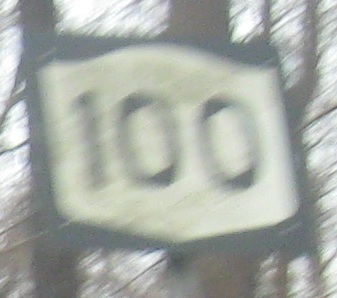 Taken from a bus, I think I did a decent job of where NY 100 NB begins as it leaves I-87 NB.